October 28, 1988. From its source at Williams Prairie to one mile from its confluence with the Crooked River. Wild — 12.2 miles; Scenic — 8.2 miles; Recreational — 13.3 miles; Total — 33.7 miles. 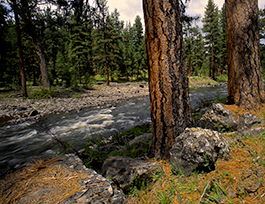 Old-growth Ponderosa pine is the headline act in the river corridor. Other players among the wide assortment of species include upland sagebrush, juniper and mountain mahogany. The canyon sections of the river provide relatively pristine opportunities for fishing, hiking, hunting and other semi-primitive experiences. The remoteness, solitude, natural beauty and a wide variety of flora and fauna contribute to the recreation values. Outstanding scenic views include wet meadows, rocky cliffs and old-growth Ponderosa pine forests. Downstream from the river's confluence with Deep Creek, the landscape elements include steep-sided volcanic canyons interspersed with old-growth Ponderosa pine forests and riparian meadows. Mule deer, elk, coyotes and various birds of prey use the river corridor for feeding, nesting, shelter, or travel, and bald eagles use the river corridor during the winter. Wild rainbow and redband trout occur throughout the river.